Karan Johar Shares First Picture Of Adorable Twins Roohi And Yash, Receives Heart From Kajol! Finally, after months of keeping everyone wait, filmmaker Karan Johar shares first picture of his twins, Roohi and Yash on the occasion of Raksha Bandhan. Karan Johar, who became a proud father to twins through surrogacy, has shared their picture for the first time on social media, leaving everyone awestruck. 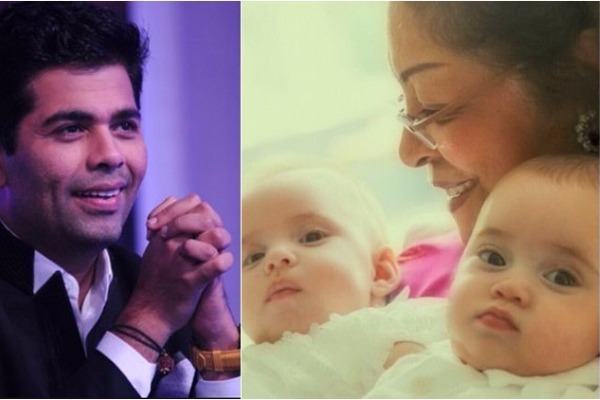 The adorable photo sees his twins cuddled by Karan Johar’s mother Hiroo Johar. In no time, the pic received thousands of likes from fans and Karan Johar’s friends from the industry. However, what caught everyone’s eye was Kajol’s like on Karan Johar’s photo. Yes, Kajol could not hold back and clicked liked on the Instagram picture of Yash and Roohi. Also Read: Oh Man! Karan Johar’s Luxury Gucci Bag and It’s Pricey Tag Will Blow Your Mind! And guess what? Karan Johar responded in some time, by ‘following’ her back on Instagram. Just a few days ago, Karan Johar fans had tweeted him lines like ‘But she’s your best friend yaar’ from their film ‘Kuch Kuch Hota Hai’ as the filmmaker hadn’t wished Kajol on her birthday, which was on 5 August. Well, are they burying the hatchet? Will Karan and Kajol come together again? Time will tell! Previous : Shocking Split: Actor Chris Pratt, Anna Faris Breakup, Fans Blame Jennifer Lawrence! Next : Here Is How Karan Johar And Kajol Patched Up Once Again To Be Best Pals!